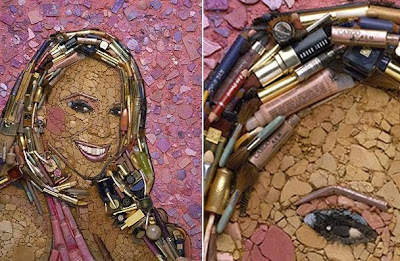 Collection of Creative and Unusual Celebrity Portraits from all over the world. 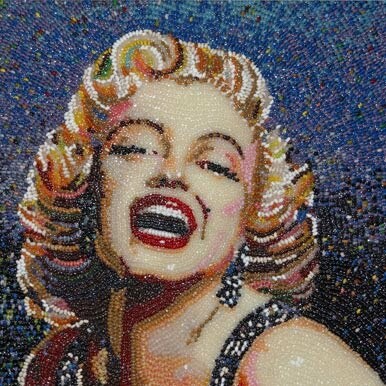 Marilyn Monroe Portrait Made from Jelly Beans: This come from Jellybelly art gallery and is the creation of artists P Rocha, R Rocha and Malcom West. 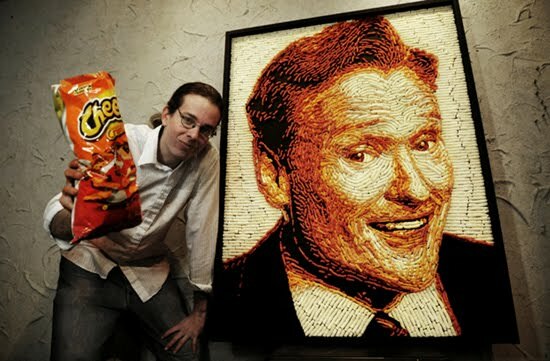 Cheetos Portrait of Conan O'Brien: Colorado Springs-based artist Jaon Baalman used over 50 bags of Cheetos (over 2000 individual Cheetos) to create edible portrait of the popular Conan O'Brien. Mariah Carey Portrait Made of Make-up: This portrait is the creation of San Francisco-based artist Jason Mecier using make-up and beauty products. 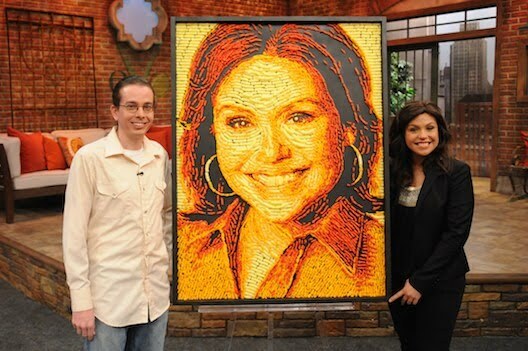 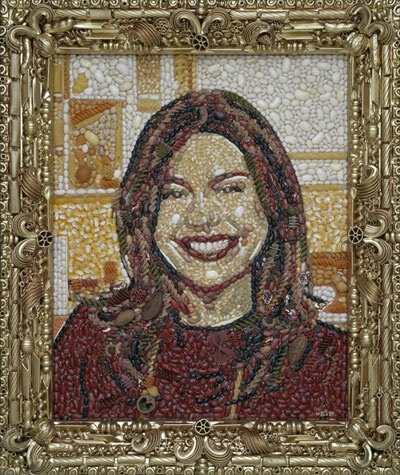 Ray's Portrait Made out of Pasta: A portrait of Ray made out of pasta created by artist Jason Mecier. 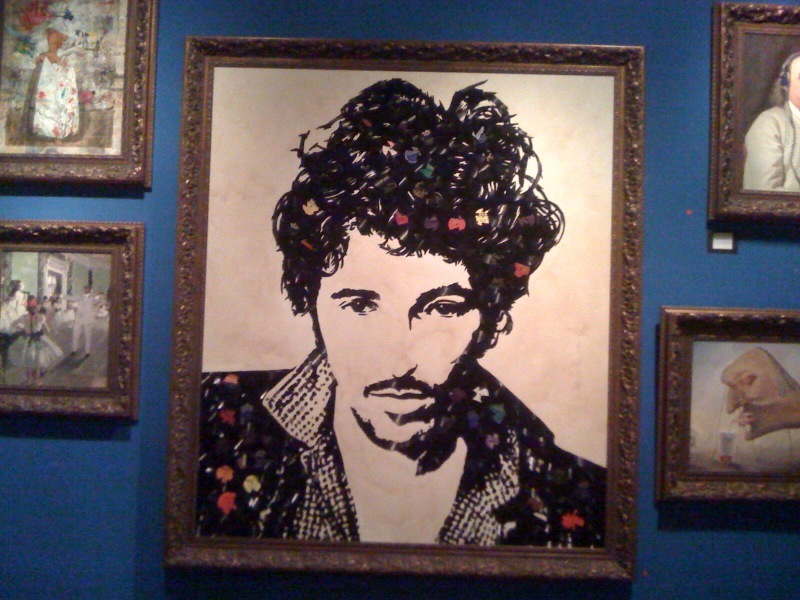 Lady Gaga Portrait Made of BBs: The portrait is made of 61,509 airsoft BBs; using just 5 colors artist O'Hearn took about a month to create it. 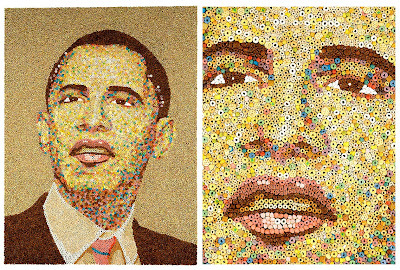 Portrait of Obama Made Out of Cereal: Hank Willis and R Alexiev created this sugar-cereal portrait of Barack Obama. 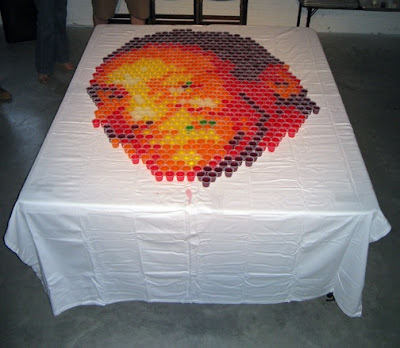 Bill Cosby Portrait Made of Jello: This portrait is entirely made from Jello. 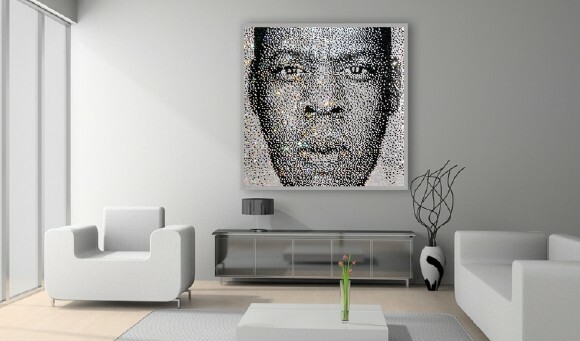 Jay-Z Mosaic Portrait made of Swarovski Crystals: Artist Adrian Firth created this portrait of Jay-Z using 22,500 Swarovski crystals. 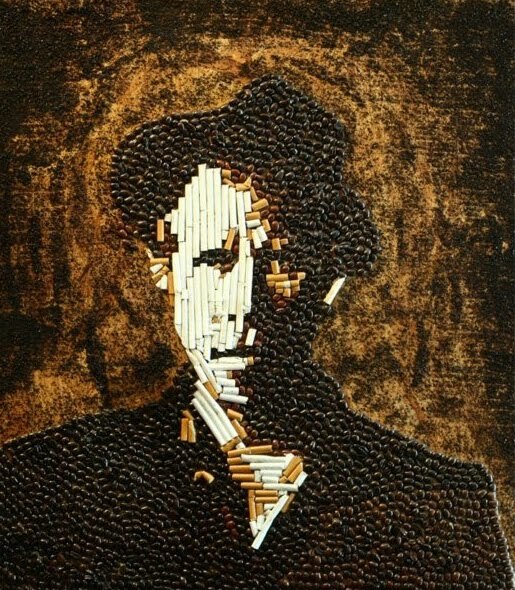 Tom Waits Portrait Made of Coffee Beans: Creation of artist Mike Oncley. 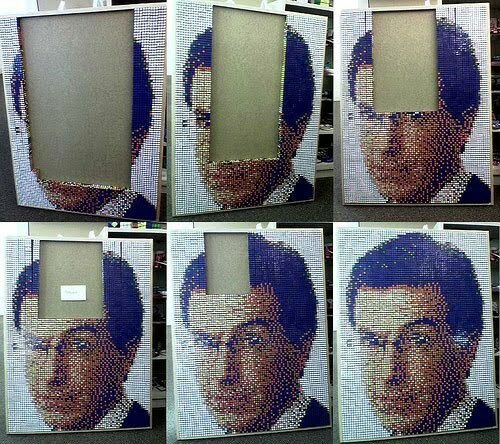 S Colbert Portrait Made of Rubik's Cubes: This portrait is made up of 768 Rubik's cubes, took around two weeks for California-based artist Dave Litwin to create it. Bruce Springsteen Portrait Made From Broken Vinyls and CDs: Artist Thierry Guetta uses broken CDs and vinyls to create this portrait. 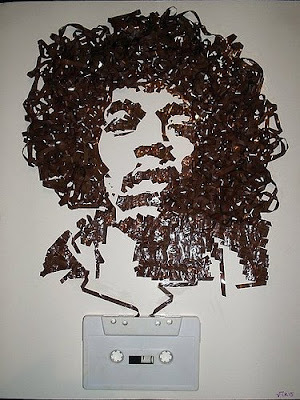 Jimi Hendrix Portrait Made from a Cassette Tapes: Artist Erika Iris Simmons creates portraits of rock stars using old cassette tapes. Cheetos Portrait of Ray: Another creation of Jason Baalman; he used about 50 bags of four different flavors of Cheetos to create this portrait of Ray. 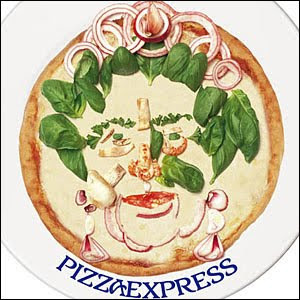 Queen's Face Made From Basils and Onions on a Pizza: Edible faces of British celebrities were created from fries and pizza ingredients to celebrate British National Chip Week.